Don't worry, be happy. 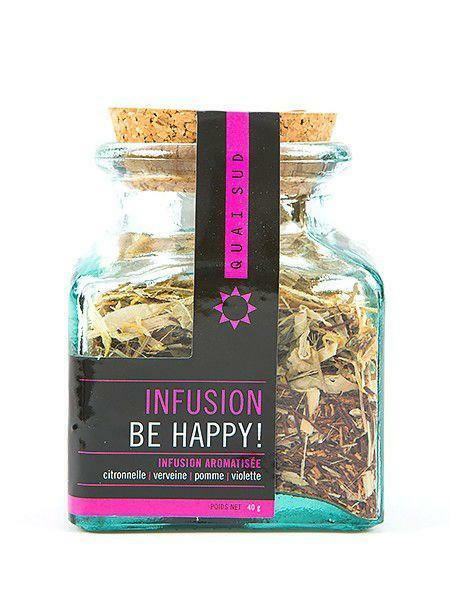 Let your smile beam from ear to ear with this healthy blend of herbal loose leaf tea. A high quality blend of red rooibos with a hint of violet tastes delightful every morning. Just infuse 1 full teaspoon in boiling water for 3-5 minutes. Comes presented beautifully in a glass jar with cork top. Ingredients: red rooibos from South Africa, 6.9% candied violets (sugar, 2% natural flowers, coating agent: gum arabic, colouring agents: E120, E132, flavour), 11.6% lemongrass, 3.8% verbena, 3.8% flavour (apple), 2.3% apples (apple, E223 (sulphate)), calendula petals. Possible traces of nuts, gluten, mustard, sesame, milk, eggs, sulphate, soy."